Everybody loves butterflies. They flit and flutter on the most delicate of wings. Unlike hard-bodied insects like beetles, they seem too fragile to even survive. But the facts of their unique life cycle are truly fascinating. Take the monarch butterfly. Monarchs mate and lay their eggs in North America, migrating up to 3,000 miles to overwinter in warm sites. Monarchs west of the Rocky Mountains roost here in Southern California, and those from east of the mountains make their way to Mexico. Couple that with their very specific diet of plants from a single genus, the milkweeds, and their existence begins to seem almost miraculous. Monarchs are very specific in their requirements for host plants; only species of milkweed (Asclepias) will do. Once a common roadside weed and often found in row crops such as corn and soybeans, milkweed has been nearly eradicated in many states through the use of new herbicide regimes. It may be critical for home gardeners to bridge the gap and plant milkweed to support the monarch migration. There are about two dozen other butterfly species that are commonly found in the coastal Santa Barbara area. There are swallowtails, whites and sulfurs, skippers, blues, hairstreaks, and metalmarks, as well as a group known as brush-footed butterflies. The key to attracting them to your garden is in choosing the plants that they love. These come in two distinct groups: plants that supply the larvae (caterpillars) with food after they hatch from the eggs and plants that offer food to the adult butterflies once they emerge from their chrysalises. As you might suspect, native butterflies have favorite native plants, but many will also find some of our more exotic garden species a fine substitute. To attract that egg-laying female, choose plant species that provide the first food of the caterpillars. Trees such as willow, ash, poplar, and cherry will support offspring of the western tiger swallowtail, mourning cloak, and Lorquin’s admiral butterflies. 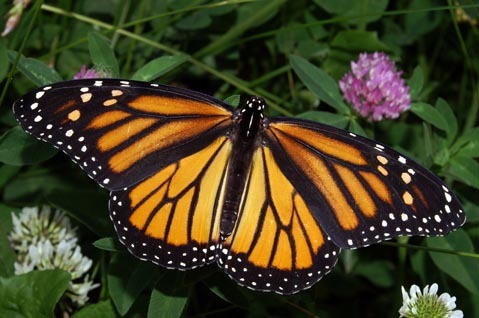 Queen butterflies, like monarchs, prefer milkweed plants. Cabbage whites feed on leafy plants in the cabbage family like mustard, arugula, and cabbage. Some of the sulfurs, orange sulfur, and clouded sulfur, as well as Acmon and marine blues, California dogface, and funereal duskywing, all go for plants in the pea family. There are some specialists among the native butterflies. Gulf fritillary larvae feed solely on members of the passion flower (Passiflora). The anise swallowtail prefers fennel plants Foeniculum vulgare (as well as a few rare California natives in the carrot family). Adult butterflies need high-quality food for the energy to find a mate, consummate that union, and, for the females, lay the eggs for the next generation. Some plants that reliably provide “hi-octane” nectar rewards to pollinators have floral structures that are very generalized and thus accessible to many different insects. Plants in the sunflower family including purple-flowering thistles, asters, chicory, dandelions, goldenrod, and tickseed (Bidens species) are all good candidates. Mints, mallows (including hibiscus and natives in the genus Malva), and sages all offer nectar from flowers that are also easily accessed by butterflies such as cabbage whites, buckeyes, and common hairstreaks. Other sugar- and protein-rich compounds like tree sap, animal dung, or bird droppings are the choice of a few species. Mourning cloak and red admiral adults prefer tree sap, although both will condescend to slurp up juices of rotted fruits or the nitrogen-rich smears of bird droppings if they must. Nectar from flowers is famine food for them.